Teeth are remarkable. It truly is amazing how strong, durable and aesthetically pleasing natural teeth can be. However, they are not invincible. Poor dental hygiene and diet can lead to issues later…painful issues. A toothache often occurs when bacteria and microorganisms are able to eat through the natural hard, protective surfaces of your teeth. They can work so deep into your teeth in fact that they reach the nerve center, then bam! The toothache pain train has pulled into station. 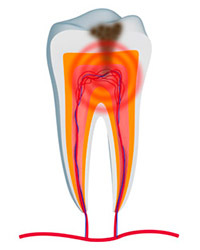 When infection hits your tooth pulp (nerves) normally protected by the enamel and harder tissues of your tooth, you may find yourself in need of a root canal. A root canal is a restorative dentistry treatment that involves removing the infected tissue (tooth pulp / nerves) from the “canals” of your tooth root. The canals are then sealed off and, depending on the state of your natural tooth crown, you may have a new dental crown placed. Though root canals have received a bad reputation over the years by some, modern endodontics makes the root canal procedure comfortable and extremely beneficial. In most cases, dentists agree that it’s best to preserve the natural tooth. Root canals allow you to keep your natural tooth but remove the part that can cause issues later. WHY SHOULD SAN DIEGO DENTIST, DR. ORTEGA, PERFORM MY ROOT CANAL? Though many dentists offer root canal therapy, San Diego dentist, Dr. Marcos Ortega, offers the best in modern root canal procedure as well as the care and compassion to make sure you are comfortable and relaxed during the entire procedure. Dr. Ortega and his staff will help you feel at ease and will work with you through the entire root canal process. If you’re experiencing a toothache, don’t hesitate to get it checked out. Give us a call, text, or contact us using the form on this page today and schedule a visit at our San Diego dentist office, located near Hillcrest and Mission Hills. We look forward to helping relieve you of toothache pain quickly and effectively!